FSW 2014 Applicants Timeline- Lets Network Here. Discussion in 'Skilled Worker / Professional Immigration' started by ashif_eee, Apr 24, 2014. Sent along with the application. I'm a 22nd May Applicant, just got an e-mail from citibank that my CC has been charged. Dear admin, pls update ss as I don't know how to do it. Congrats, please update the SS!! By the grace of God, I believe I will share my success good news on this forum come Nov/Dec 2014. I love this forum. Congrats to all successful applicants and prospecting applicants. Kudos to the founder(s) and members of this forum. brother...I would suggest not to wait to get ur app package back (God forbid), start looking for other nocs, as u r related to computer field, the other nocs can work but they might also get filled sooner then other, though not hot ones, so start preparing ur app, making things will take time, I pray that ur app in 2174 get accepted and u may also succeed as we all are going to be inshAllah by God's grace but keep ur backup ready for the worst. the main thing to consider is hope and efforts.......never ever loose hope, never ever give up on ur dreams (not cos John Cena says never give up ) , keep ur hopes high, keep trying, keep struggling and believe me when one door is closed, other 100 doors are opened, we just need to find them. I have already received PER from CIO. At the time of application i was in an another country for a temporary purpose (Visit visa) and recently i returned back home country, India.So,I have to report changes in my application to NDVO such as Present country of residence,present address of my and spouse and my phone number in the present country. While entering the details in the CASE SPECIFIC ENQUIRY which way of below method should i follow ? Which is better among above 3 options ? Thanks a lot everyone for your help and support. Card was billed on 3rd September 10:40 am, but my friend saw it today and updated me. Admins, would you please update the spreadsheet for me? I also met with a minor accident today, an hour ago and the CC charge is covering up my pain a lot. Fell from my bike while coming back from office and had several injuries on most of the right side of the body. Noting to worry about, going for first aid in few minutes. Once again thanks a lot everyone. Write new changes by explaining in enquiry section. How can I Update SS ??? A friend of mine has applied for 2133 NOC for Electrical Engg. She did her Masters and worked in the US for 3 years way back in 2007. Her current residency is India. While in US, she lived only in one state (New Mexico). For PCC, she just got a PCC from the local police department in New Mexico and submitted the same with her app. My question, is, i see many posts in this forum, from people, about getting PCC for FBI. Could you please clarify in what case, would an applicant have to take PCC from a Federal agency like FBI? Is it because this applicant has lived in different states in the US during their tenure? Will her PCC from New Mexico work in her case? From FBI site it says 30 calendar processing days + mail time. I hope this is true. Has anyone requested PCC from FBI from Bangalore, India? If yes, please let me know where you got the fingerprinting done from and how much it took for you to get the report from FBI? Hello friends. Got the much awaited mail this morning. A psychologist walked around a room while teaching stress management to an audience. 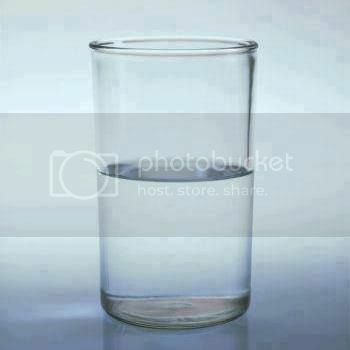 As she raised a glass of water, everyone expected they'd be asked the "half empty or half full" question. Instead, with a smile on her face, she enquired: "How heavy is this glass of water?" Very inspiring dear. Good post for all whom are waiting for the processing.